Thanks for the opportunity to win such a beautiful book! I would LOVE to win the book. Thanks for the opportunity !!! I have been reading about this book! Would love to have a copy and try the projects! I'm following on the Pink Chalk site. This is just what I need! I would love to win! Thanks for the giveaway of this book. Would enjoy using One-Yard Wonders to sew along with Pink Chalk. 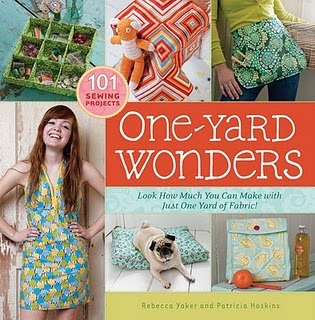 This looks like a great book, I have a new (to me) sewing machine I need to use! I have the 'one yards' by the boxes full now I need to know how to make them into Wonders! would love to try this book out~! This would be a fun book to own, thanks for the chance to win. This looks like a very interesting book and useful to help use up some of my stash! Great giveaway! My daughter and I have been thinking of getting this book. Thanks for the chance to win. This looks like a great book and I love what I've seen so far on the Pink Chalk sew along! Would love a copy! such wonderful projects in this book! I would love to be in the running to win this - thanks for the awesome giveaway! I would really LOVE to win a copy of this book...I've been eyeing it off for a while! Awesome book! Thanks for the chance to win! I just got my first sewing machine, and this book looks super fun! I've been eyeing this book since it came out. Thanks for the chance! Thanks for the give away. I would love to win this book. I've been wanting this book for some time now but just haven't bought it for some reason. The projects look amazing. I would love to win one of those books! Maybe I can help the stash pile to dwindle! I would love to have this book. If I win, I think I'll buy another for my 91-yo grandmother so we can do our own sew along. Thanks for the chance to win! Bobbie23nc is the winner (via Random Number Generator)! Congratulations Bonnie and thank you all! Sweet! This book looks awesome!